This is one year that I'm actually sad to think that Summer is coming to an end in a few weeks. Well, unofficial summer that is. Kids will be going back to school, pools will be closing, Christmas stuff will be on the shelves and more. The last few weeks have been amazing weather wise, which has made this summer a lot more bearable. I certainly hope it stays like this when it's seasonally appropriate as well. As summer unofficially starts closing up shop, many of us will be getting in as many more good moments with our grills as we can. Especially over the Labor Day weekend. One of our favorite things to grill is burgers. Out of nowhere earlier this summer I got a huge desire to put queso on a burger. I still have no idea why, but it was right there, this urge, just waiting to finally come to fruition. A week or so later I made my first Queso Burger. And I've had several more since then. I literally cannot get enough! And a bonus is that I usually have enough leftover queso for Rob and I to snack on some nachos late a few nights later! As always, Rob and I like things a little on the simple side, but there are many things you could do to spice this burger up, pun intended if you add roasted chiles! Prepare your grill for direct grilling over medium-high heat. In a large bowl, mix the beef and taco seasoning. Form the mixture in to equal patties. Using your thumb, make an indentation in the center of each patty to allow the burger to grill up without bubbling up in the center. Grill the burgers over direct heat, turning once and cook until done to your liking. Remove from heat and allow to rest for a few minutes while toasting buns. 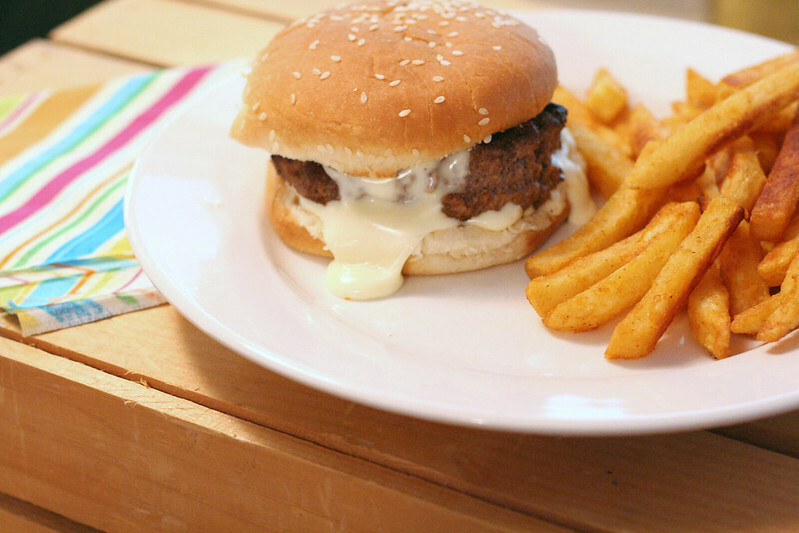 Place queso on top of the bottom bun. Top with burger, more queso and other desired garnishes, such as avocado slices or salsa.